Note: This program is pending approvals from Senate and the Ontario Universities Council on Quality Assurance. Are you passionate about science, but unsure of what discipline to major in? 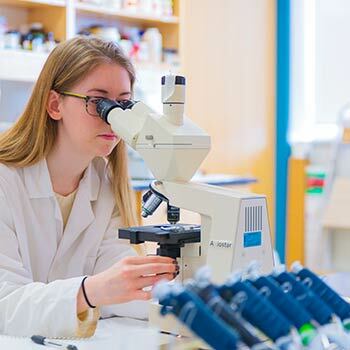 In our Bachelor of Science (BSc) in Honours Science program, you have the freedom to discover your own path in this broad, expansive science-based program. This flexible program allows you to design your own science education. Take courses range of courses across science disciplines, including biology, chemistry, psychology, and more. Participate in hands-on labs, using state-of-the-art equipment. Advanced Functions, Biology and Chemistry each at 60%. HL or SL English, Math, Biology and Chemistry at 3.